After the day I spent touring the Greater Victoria region with a geologist, I staggered around for many days seeing my familiar surroundings with new eyes. The first thing I wrote about this experience was the Into The Deep Past post here on the Sci/Why blog and for my kayaking friends on the Kayak Yak blog. I should also write about the next day as well, when I went wandering into the past, but not so ancient. It was still pretty long ago by modern standards. Let me digress a little. We modern Canadians tend to think of things a thousand years old as pretty darned old. But around this part of Vancouver Island and the Salish Sea, there are traces of humans five thousand and possibly ten thousand years old. Or more. I don't know how to see the past as clearly as I'd sometimes like to do. Archeology is an exact science when scientists do it. But studying the past can be something done with my hands and feet, in a casual way. I don't confuse it with precise measurements and exact study, and there's so much that can be learned. People in Europe can go look at the Parthenon in Greece, and see marble carvings etching in modern air pollution, or walk along Roman roads that were built to last. Two thousand years seems like a long time in Europe, with artifacts to look at all along the way. The Great Pyramids in Egypt are older, and we've still got the invoices for beer and onions for the workers, in museums somewhere. But the history books don't always tell the whole story -- like the olive tree on the hill next to the Parthenon that tradition holds was a gift from Athena herself. Or the marching songs that let Roman soldiers keep time with a 30-inch stride that added up to exactly a mile marched at the end of the right number of verses and choruses. At least local history books about Victoria tell that the main wandering roads through Victoria follow old footpaths from before the Hudson's Bay Company built a fort here. One of the oldest footpaths became Cedar Hill Road. When I follow Cedar Hill Road, it's easy to tell that it's been a road for a long time, long before the colony settlers started using it a hundred and fifty years ago. I don't need the historical records to tell me this. My feet tell me this as I walk along, or ride my bike. The road follows the creek up from the Cordova Bay shoreline, and then heads south, always staying out of the low valleys where streams would make the going muddy, and usually paralleling the high ground on a more level track than the highest points of the ridge. Instead of a surveyor laying out a road with a level and scopes, this route was laid by the time and motion analysis of many feet taking a sensible path over hundreds of years. Practical knowledge can be science, too. This road was going to places important to the people who made the original footpaths. I could tell that these places are important, because of what still can be seen along the way. There are old fields and Garry oak meadows that still bloom with camas flowers, a crop grown by the First Nations peoples. There's Spring Ridge, where good water welled up year-round. And there were villages where the Royal Victoria Yacht Club is now on Cadboro Bay, and Willows Beach on Oak Bay, and Gyro Park Beach on Cadboro Bay. Okay, so that was a longer digression than expected. But really, that path took me right back to my home waters in Cadboro Bay, where my friend John Herbert took these photographs. We've taken our kayaks out on the bay hundreds of times, at all levels of tide. 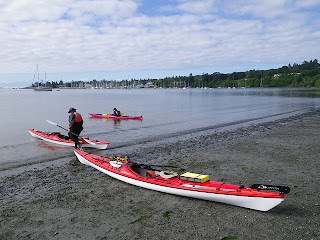 And this day I started writing about, the day after my tour with the geologist, I set out to do an ordinary paddle out to Flower Island and back. But I was still seeing the past all around me, manifest in the present tense. When you're out in a kayak or other small boat, you get used to being aware of the weather around you. But now I was sensitized to seeing the past. I saw the slight rise at the shoreline above the beach by the east end of the park, where the land rises for less than two metres. It's a midden, where there was a village. I saw the flat sand exposed by low tide, where clams blow little holes up, fewer now than when I was a child, but there must have been more, enough to harvest, a hundred years ago, two hundred years ago, a thousand years ago... And when I pushed off, my little boat was floating into the places where it showed me what this shoreline was like a long time ago in human terms. It's hard to keep track of all the local names for islands and points and bays around here. There's a different name for most places in each of the local First Nations languages. Some of these places were used by different groups at different times, or at different times of year. My paddling group is learning names from charts. We also make our own names for the little rock garden, the big rock garden along the Uplands shore, the channel that someone has blocked by chaining a steel float, and where we see animals. I'm not sure how long ago the sea level was at the point that we see nowadays as our zero tide. Only on the lowest tides at the winter and summer solstices each year does the tide get that low nowadays. But during the latest Ice Age the water level was lower still. I paddled along the northeastern shoreline where the little rock garden would have been a lumpy point of land sticking out from the rocky shore, as it is during low tide. I looked across to the other shore that rises above the west end of the beach, and saw that there had been a slide or a slump of part of the bluff. Until then, I had been assuming that most of that bluff was made of the same rock as this side of the bay. But no, the slide showed sand. It made sense after a moment's thought. There are sandy bluffs miles up the peninsula, up near Island View Beach, and on James Island and Sidney Island. But I didn't know this bluff was made of sand. I'd never tried to climb it, so I hadn't learned what was hidden under the greenery covering the steep slope. There's plenty of greenery trailing over the rocks on the rocky side, too. It was the sand showing against the greenery that let me see from across the bay that there had been a landslide. The new edge of the bluff looked rather too close for comfort to the patio of one of the fine houses along the top of the bluff. Suddenly, I felt even less craving for a waterfront house than ever before. 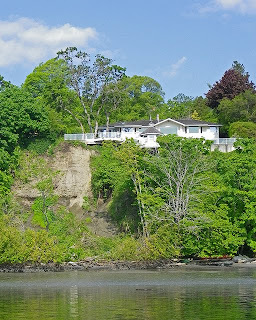 And now I understood why Cadboro Bay is so shallow under that bluff when it's deeper along the east shore -- under the bluff here is like the shallows south of the bluff at the end of James Island. The sand slumps. It's been slumping since the glaciers retreated at the end of the latest ice age. When I paddle over that shallow, sandy-mud bottom, I'm paddling over ten thousand years of sand slumping into a basin scoured between the bedrock of the east shore and the bedrock of the Uplands shore along the west and south. The tides pull the sand out and spread it along the beach between the arms of the bay. There's been a sandy beach here for ten thousand years. That's only a heartbeat in the geological time that Dr Yorath the geologist showed me how to see. But it's all the time that the Salish-speaking people have lived at this end of Vancouver Island. I paddled a little further along, to one of the little islands in the bay that are part of the Ecological Reserve. People don't go ashore on those islands -- they're bird sanctuaries! There are other reasons not to go ashore there, as well. These were important places for First Nations people, places of transition. There are stories shared in books and on websites about how there were stones at special places here along the coast, stones regarded as ancestral guardians showing good ways to travel or where to look for food. Up north in the Arctic, the Inuit built inukshuks and other stone markers. There are similar stories from Europe about the standing stones in fields and hills. I looked at one of the little islets in the bay, with a large stone on it. The first time I saw it, I knew that this stone was clearly a glacial erratic left behind by the ice. But this time, when I turned away from the little island, I looked across the bay and could see the two old village sites. The modern houses faded to my new way of seeing -- I could see that this was a good spot to look over on both villages, from what would have been a little point or peninsula, not an island. This stone makes a good memory stone. I drifted on for a while, paddling slowly. Flower Island was living up to its name, all a-bloom with blue camas flowers. This island was someone's place to gather camas bulbs for special feasts, right up till a hundred years ago or so. This basalt rock would have been connected to the point ten thousand years ago. The narrow channel that separates Flower is also a shallow one. I took my boat around Flower to Evans Rock, where there's another channel, shallow at low tide. 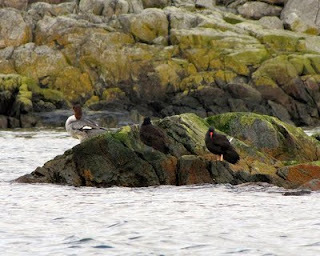 John took this photo of a seagull and two oystercatchers there. Drifting along, I could see the bottom is white there, not the white of barnacles so much as the white of a shell beach. How long ago was this channel a beach for harvesting oysters and clams? A thousand years, five thousand years ago? The sea level has risen to hide the shell beach. Only at a zero tide is the water shallow enough for me to see the bottom and guess at the work of hands opening shells, gathering seafood for all those years, all those years ago. I remember that one time I was talking with my mother about Discovery Island and the Chathams, near Victoria off Oak Bay and Ten Mile Point. She hadn't known that much of those islands are an Indian Reserve. She wondered why the local First Nations people hadn't developed that area. After all, Victoria had plenty of houses and businesses, why not there too? I tried to suggest that maybe the people who had been using these little islands for thousands of years had developed them just exactly the way that they found them most useful. Digging clams, fishing, raising little dogs for wooly fur -- these were practical things that didn't require obvious monuments like pyramids or Roman roads. If I am to tell the truth, I would report that never in my wildest imagination did I dream I would become a science writer. When I was in elementary school, science was my most dreaded subject. It was tedious and achingly boring. In my memory, our lessons were mainly composed of flipping through worn textbooks full of line drawings showing how the earth revolved around the sun, and how the moon revolved around the earth. (Or were they rotating?) I never could quite figure out how night and day and the four seasons resulted from all this spinning. Nor could I figure out how any of this related to me. I’m glad to say that I eventually sorted it all out and have now developed a lasting appreciation for science, both in books and in my everyday life. Where did my appreciation come from? I owe it all to the kids. Here’s what happened. One day, long before I knew I’d be a writer, I became a teacher and spent more than a decade in a primary classroom. There’s no better place to get a firsthand view of the delight children experience from nature and the living world. Kids know there’s nothing more wonderful than peering into the tall grass to see a tiny ant scurry by, or watch busy squirrels chase each other along the branches of a tree. They love to tell you which wild animal is the biggest, the strongest, the fastest or the most fierce. Kids see the magic in the garden as they plant a seed and watch it grow. They find joy in every detail of a changing season. When I moved from teaching to writing, I never forgot my students. I made it my goal to write books that they would enjoy — books on nature, wild animals, gardens and growing — all for the youngest readers. I didn’t really think of these as science books, nor did I think of myself as a science writer. I only knew that I was trying create books that reflected the world the way a young child sees it — books that captured an appreciation of the wonders of nature, and answered some of the questions that kids have about the earth and its living creatures. These books weren’t much like the serious science books of my school years — so I wasn’t sure I qualified as a science writer. But, as I look around in schools and bookstores today, I understand that I need to expand my idea of what science writing is. Gone are the stiff and formal books of yesteryear. Replacing them is an explosion of bright, colourful books, full of engaging information for modern kids. What an amazing transformation! I’ve had to shift my thinking to entertain the possibility that what I write may indeed fall under the banner of science writing. Me, a science writer. Who knew? I’m thrilled to be included! Deborah Hodge is the author of Up We Grow! 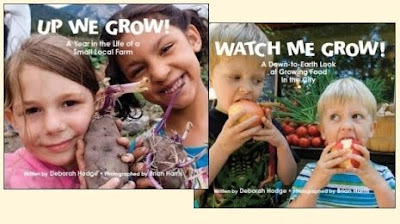 A Year in the Life of a Small Local Farm and 25 other books for children. How big can an earthquake be? Last month, a few people thought the world was going to come to an end. There was not scientific basis for their worry whatsoever, but still they raised a few eyebrows. In one Toronto Star article (that the Star did not share online), geophysicist Qinya Liu discussed ways in which the world, or at least human existence, could come to an end—and systematically ruled them out. Her reasons seemed plausible. We'd know if a meteor the size of the moon were on a collision course with the earth. The biggest volcanic eruption in human history left 10,000 people alive to repopulate the planet (rather successfully, too!). Nuclear weapons have been around for half a century and we're no more likely to use them now than ever before. Alien invasions are the stuff of bad summer movies, not reality (so far). A big enough earthquake isn't possible. That last one caught my attention. We just saw widespread destruction in Japan from a massive 9.0-magnitude earthquake. That's among the most powerful earthquakes in history and it struck a densely populated area. The carnage was terrible, and more than 15,000 people died. Still, that's nowhere near wiping out all of humanity. Is there a maximum magnitude for earthquakes? 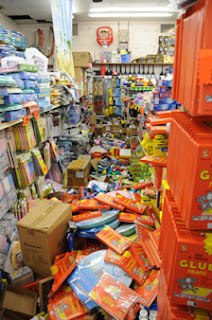 Earthquake damage to store, California 2010. Even in science fiction, wiping out the human species takes at least a 10.5 earthquake. Nobody knows what it would really take. But why is an earthquake with a magnitude above 10 impossible? First, you have to remember that the scale we use to measure earthquakes is exponential. A 4.5 is ten times bigger than a 3.5. That means a 5.5 is 100 times bigger than a 3.5. I remember a 4.5 quake on Vancouver Island that woke me up one morning. It felt like someone was jerking my bed and sounded like a tractor trailer was going through the garden. A 10.5 quake would be one million times more powerful. One million. The biggest quakes in history top out around 9.5, and that's only 100,000 times more powerful. A world-destroyer would have to be at least one-million times the strength of the quake that shook me awake that morning! It takes a lot of energy to make continents move like that. But if they can hit 9.5, why not 10 or 10.5? For an answer, I turned to Stephen Johhston, a geology professor at the University of Victoria who specializes in earthquakes in subduction zones (where one plate goes under another—it's where the biggest earthquakes occur and most mountains form). He said it has to do with how strong the rocks are. "Earthquakes occur when rocks break in response to a buildup of stress," he said. "Imagine taking a long, skinny icicle and you start trying to bend it until it breaks. You will not have to expend too much energy before the icicle breaks, because the ice is fairly brittle and 'weak.' But if you took a similarly shaped wooden stick, it would take you considerably more effort to break the stick. In other words, the earthquake you produced by breaking the stick is greater than the one produced by breaking the icicle." There is a limit to how much pressure rocks can withstand before they break. So they'd break before enough built up to cause a humanity-destroying quake. Most researchers figure that limit is around 9.6, Johnston said. How deadly is a big quake? Big earthquakes can be deadly, causing buildings or bridges to collapse and crush people. But most people who die because of a quake aren't killed directly by the shaking of the ground. Sometimes earthquakes can trigger deadly landslides. But the real carnage comes from tsunamis. These are huge waves, sometimes higher than a house, that are caused when an earthquake happens under the ocean. In the Japan earthquake this year, much of the destruction came from tsunamis. And earlier this decade, deadly tsunamis killed more than 100,000 people around the Indian Ocean. Because the big earthquakes, those above 9.0, happen in subduction zones, they tend to happen under water. The shaking can cause big destruction on land, too, but the greatest risk is to people who live in coastal areas. In other words, even the biggest earthquake possible simply could not kill all the people on Earth. Craig Saunders is a writer, editor and author of What is the Theory of Plate Tectonics? (Crabtree, 2011). He lives in Toronto. This year, I missed the first day of Paddlefest in Ladysmith, BC on a Saturday, May 14. After five years, it was a disappointment not to be there to see all the boats lined up along the shore, and talk with other kayakers. But I missed the first day of the kayaking festival for something really good instead -- something my kayaking group has been looking for since we first paddled off Sidney, BC. It was all for rocks. One look shows how different the rocks are from one headland and island to another around Vancouver Island. There's something important to learn about geology here on the Saanich Peninsula. Look at some of my kayaking group's photos from Robert's Bay and Coal Island and the Little Group! But how to learn about the local rocks? Hands-on is the best way to learn in the physical sciences. Learning about these places takes a tour with a real geologist, not just a rockhound. And I got one on that Saturday in May. The Capital Regional District of greater Victoria set up the tour, finding a geologist from the Pacific Geoscience Centre on Patricia Bay near the airport. 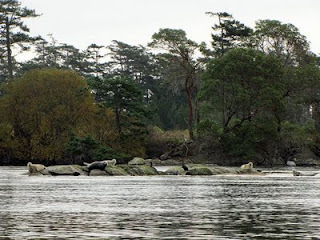 Dr Chris Yorath took two dozen of us volunteer naturalists off on a wild tour of several sites, from Island View Beach and Parker Park to Cattle Point, Finlayson Point, Goldstream River, Esquimalt Lagoon and then to Tower Point at Witty's Lagoon. Most of these places I've been to lots of times as a child and an adult. Tower Point is a park that previously I've only seen from my kayak, when we're rounding Albert Head and going to Witty's Lagoon. You can see blog posts by my friends and I on the website Kayak Yak about that area here. Parker Park is a beach access that I hadn't used before, but around Victoria there are beach accesses everywhere. The municipality of Saanich had to explain to a developer last year that property fronting onto Portage Inlet couldn't just cut off public access to the beach. I love it that the government is on our side on the issue of beach access! Walking along the shoreline at place after place, Yorath spoke about the ancient origins of several kinds of rock in this part of the world. As the continent of North America drifted westward for millions of years, it ran into island chains (something like Hawaii today) that piled up along the West Coast. All of British Columbia is made up of these wrinkled ridges of rock, previously separate but now smushed together, called terrenes. Several of these terrenes can be found packed together here at the south end of Vancouver Island. Even easier to see were the most recent geological changes, caused by the glaciers of the most recent Ice Age. Yorath showed us basalt pillows that originated in undersea volcanoes a hundred million years ago, and that have been carved away by glaciers. The rock underfoot has veins of quartz, tilted layers of shale, sandstone, sandy bluffs, and conglomerate. Yorath is exactly the geologist you want for a tour like this one! He literally wrote the book on local geology -- Geology of Southern Vancouver Island, revised edition. While we were on the beach at Parker Park in Cordova Bay, we ran into students from Royal Roads University who carried copies of the book. Shyly, they asked for his autograph. Yorath knows his earth science, and he has been walking over these local sites for decades. The man showed us his favourite basalt pillow. Any scientist with a favourite example of a rock formation is my kinda scholar! He spoke of how the scientists who studied mid-oceanic volcanic ridges were working locally, confirming not only the theory of continental drift but the reversals of the Earth's magnetic field. The places we walked over and examined were the ordinary parks we naturalists had visited for years, but with Yorath's commentary we understood them in new ways. He showed us where the big faults were, and told us about earthquakes in the past and coming in the future. The rocks around us looked so permanent, but he showed us that we could see the changes and how one layer of rock overlay another. Fifty million year old rock actually looked newer than rock a hundred million years old. We could see the weathering and cracking in some places, and the big gouges from glaciers in others. Yorath told us that the edge of the North American continent is colliding with and riding up over the Pacific Plate under the Pacific Ocean. Those mountains we could see across the Strait of Juan de Fuca, the Olympic Mountains in Washington State, were being forced higher and higher at an inch or a couple of centimetres a year. Wind and rain and gravity was wearing down those mountains too, at about the same rate, so the peaks wouldn't get much higher than they were now. We could see why, for example, the Gulf Islands are mostly made of harder shale, where the softer sandstone has been worn away by water and glaciers. And now I understand why our beaches are a muddle of many kinds of stone -- it's because the glaciers scraped across this whole area time and again. Bits of rock and sand clung to the bottom of the moving ice and were carried for a short way or for many miles from one terrene to another before being left behind as the ice melted. During the latest Ice Age, sea level had been over a hundred feet lower than it is now. Ten thousand years after the great glaciers melted, the land here is still rebounding, springing up now that the great weight of ice is gone. During Yorath's career, the rocks hadn't changed except for the most minimal of weathering, but the understanding of geology had changed profoundly. It made me dizzy, to see these stones the way he spoke about them. Time was suddenly something to think about differently than the speed of my own movements. Hot lava emerged from underwater volcanoes, cooling quickly to glass on the outside curves of slowly hardening billows and pillows. Grit and organic debris drifted to the ocean bottom, settling down so thickly and for so long that it compacted into rock under its own weight and under new lava. Mountains split and piled up like the snow I plowed from my driveway. Smooth, flat shale and slate bent like taffy, pushed by a continent colliding with volcanoes sprung from an ocean floor. There's a big bend in the layered rock visible on a cliff above Horne Lake, up-Island, and I could see it twisting in my mind's eye, an inch a year. Rigid bedrock was springing up underfoot as the weight of the glaciers melted away ten thousand years ago. The slump at the south end of James Island, making a sandy bluff and shallows, fluttered like my hair in the offshore breeze. The ocean water around our islands was as transparent as the air to my new vision. I felt like a mayfly, or a daylily, or a shooting star, fluttering in my short, twittering life while glaciers ran like the rivers where I paddle my kayak and the limestone and sandstone silted up and hardened like the mud on my kayak and my shoes. It was humbling. You can understand that I kind of staggered around for the next couple of days. I was observing things! I was walking into the deep past, and watching how rock hardened and layered and bent. It all felt as familiar as cooking jam and watching it set, or stretching taffy, or baking an impossible pie that settles out its own crust and topping. It especially felt like shovelling snow off the frozen driveway -- the weight and the pressure and the texture changes. And of course, the rocks were familiar... they were the same ones I'd clambered over since I was a child. 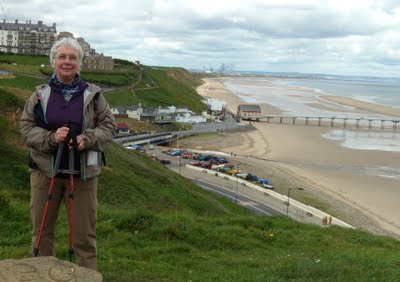 In May, I went for a walk in northern England. 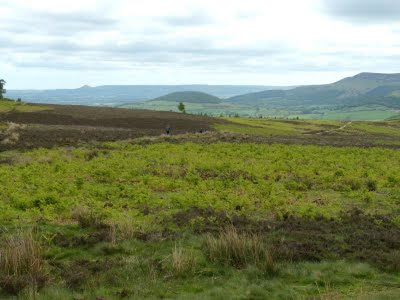 A long walk: 110 miles (they still use miles there) along the Cleveland Way in the North York Moors National Park. The experience got me thinking about parks and landscapes and people. After all, you've got to think about something when you're walking for 11 straight days! Half of the walk lies along the escarpment, with heather-covered moors stretching out on one side and the broad, fertile Vale of York far below on the other side. 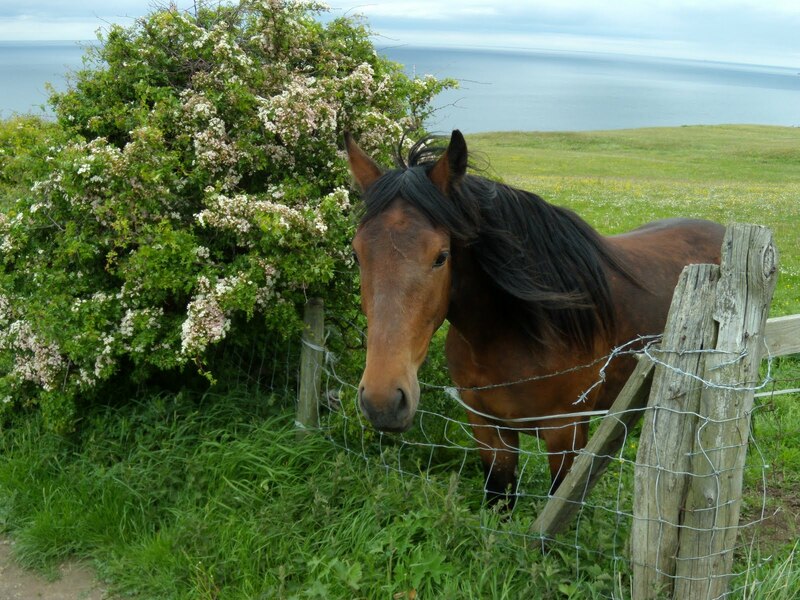 The second half takes you along crumbling cliffs that tower above the sandy shore of the North Sea. Besides the cliffs and the moors, the park contains cities, towns, villages, highways, factories, farms, and evidence of human occupation from Stone Age burial mounds to abandoned industrial sites only a few decades old. In Canada -- especially northern Canada -- we tend to think of parks as wilderness, as a way to preserve a landscape with as little evidence of people as possible. Take nothing but photographs, we urge users, and leave nothing but footprints (if that). 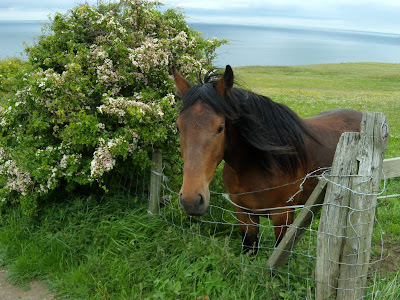 The North York Moors National Park is a different beast entirely. It covers an area slightly larger than Kootenay National Park in British Columbia, but this is not a wilderness park. Even its wildest places were shaped by humans. Ten thousand years ago, the treeless, tundra-like plateau of the moors was a thick forest that provided a living for Stone Age hunters and gatherers. Then, about 4000 years ago, Bronze Age farmers arrived. They cut down the trees to plant crops and set their animals to graze the land. By the time they left, 2500 years ago, the forest was gone and the soil was drained of nutrients. Heather, which cares nothing for depleted soil, moved in and took over. Today, the heather moorland -- with its population of nesting birds, adders, small mammals, hikers, and 30,000 domestic sheep -- is preserved just as carefully as we preserve our boreal forest and native grasslands. It's a landscape that was shaped by geology, climate, and the actions of the creatures that are part of it, including people. The park celebrates all of that heritage. The North York Moors National Park reminded me that a natural landscape includes humans. We are not separate from nature, but part of it -- just another species in the planetary ecosystem. We leave our mark on it just as other species do. And, just like them, we have to live with the consequences. Basically, we're all in this together. As I said, you've got to think of something when you're walking all day, every day!